For a light and airy dessert, try angel food cake made with all-natural maple sugar. For the avid baker, spare egg whites are a way of life. After making batches of yolky banana pudding, ice cream, chocolate custard pie, and French buttercream, those leftover egg whites can really start to pile up. When my stash hits critical mass, I know it's time for angel food cake. It's the perfect antidote to all the richness that came before, a dessert that's airy, light, and lean, but flavorful enough to stand on its own, whether served naked or with fresh fruit, a dollop of whipped cream, or a drizzle of ganache. My favorite thing about angel food cake is how easily it can be customized by trading plain white sugar for more flavorful options. In this case, I'm matching the winter weather with a dose of maple sugar. It's a beguilingly simple swap, but one that's transformative for a dessert as simple as angel food cake (a combination of egg whites, sugar, cake flour, and little else). If you haven't played with it before, maple sugar comes from cooking maple syrup to drive off all the water, which yields a crystalized sugar. It's mostly sucrose, but with a solid percentage of fructose and glucose, which means it behaves more like brown sugar than white. Not every recipe will handle the swap with ease, but angel food cake is resilient like that. Tiny, souvenir-sized bags of maple sugar often have an eye-popping price tag, but the cost comes down considerably in the bulk foods aisle of a major supermarket, or when buying larger quantities online. I went all-in with a five-pound bag, but there's no shame in testing the waters with a more reasonably sized 25-ounce package instead. I've already covered the science and technique behind angel food cake for Serious Eats but, in short, the trick is to create a relatively dense and soft but stable meringue rather than one that's light and stiff but fragile. Not only does this approach reduce the risk of angel food cake collapsing in the oven, it simplifies the actual work of making the cake. Instead of carefully adding the sugar bit by bit as the egg whites whip, the two are combined all at once and then whipped together. With maple sugar, that makes for a meringue that starts out surprisingly dark, but it'll lighten substantially as it whips. The goal of this approach is to avoid overtaxing the egg whites through overbeating, so it's important to stop whipping while the meringue is still runny rather than stiff. When the whisk is lifted from the bowl, the meringue will run right off the wires rather than form a clump inside. That meringue may pile up on itself briefly when it falls back into the bowl, but this little mound will be re-absorbed in a few moments. So forget the usual visuals of stiff peaks and fluffy piles of meringue, this style will be runny and soft! Once the meringue is softly whipped, it's folded with bleached cake flour; my personal fave is Swans Down, but Softasilk works well, too. What's important is to avoid unbleached styles*. That may not be a hip recommendation in today's organic-obsessed marketplace, but the science is sound: chlorinated cake flours have starch and protein behaviors unlike any other flour on the market, making them uniquely suited to angel food cake. For more information on the hows and whys, see our guide to bleached vs. unbleached cake flour in angel food cake. It includes side by side shots of how these flours affect the structure, rise, and crumb of angel food cake. * If bleached cake flour can't be found, try the flour blend from my gluten-free angel food cake instead. Fold in the bleached cake flour (or my gluten-free blend) with a flexible spatula, making sure to cut down the middle of the bowl from time to time to break up any pockets of flour. Once the batter is well mixed, scrape it into a 10-inch aluminum tube pan. This type of pan is an absolute must for angel food cake. 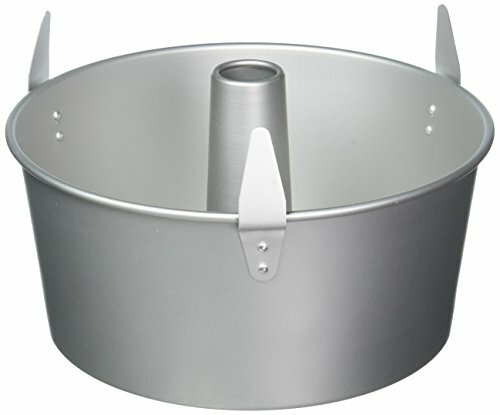 The natural aluminum finish is essential for the cake's success in rising and cooling, as a slippery, non-stick surface will impede its rise and cause the cake to fall flat when it's cooled. That's because angel food cake needs to be cooled upside down, otherwise the warm and fragile cake will collapse on itself as it cools. To that end, proper angel food cake pans have stilts for this very purpose. Once cool, the sides of the cake can be loosened from the pan with an offset spatula, allowing the cake to be plucked from the pan by the center tube. The bottom of the cake can then be loosened from the pan with an offset spatula, and inverted onto a cake stand or platter (it will slide right off the tube without any fuss). Serving the cake upside down gives the top a nice, flat surface to showcase fun toppings like fresh fruit and whipped cream, or for a simple glaze. If serving the cake plain, or with those toppings on the side, the cake can be re-inverted to show off its crackling crown. For those of us who love angel food cake, the delicate maple flavor of this variation makes it worth savoring all on its own, but for those less enamored with the style, that drizzle of dark chocolate ganache will nicely offset the cake's sweetness. Or play around—the breakfasty vibe of maple pairs nicely with the tangy flavor of other morning classics like citrus and yogurt, as well as bitter elements like coffee and black tea. However it's served, this angel food cake is a fun excuse to explore new ingredients and the lighter side of dessert.